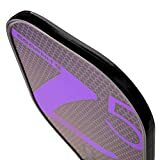 Onix Z5 Pickleball Paddle Reviews | Graphite vs Composite? The Onix Z5 pickleball paddle is one of the best selling paddles by Onix and a common paddle we see on courts around the country. That iconic Z on the face of the paddle is recognizable from across the court. Not only do recreational players like this paddle but it’s a good enough quality paddle to be seen in the hands of many competitive players in local and national tournaments. One of the most notable examples is Pro player Tyler Loong of Team Onix. The Z5’s classic widebody paddle shape is considered one of the most versatile and still one of the most common shapes used to build new paddles. While there are some newer paddles on the market making a buzz with their unique, elongated shapes, many players still prefer the simplicity of the old widebody shape and many beginners find the large hitting surface and sweet spot easier to play with especially when they are starting out. Both of these paddles are approved by the USAPA for tournament play. That’s not a big surprise there since we already mentioned that some professional players use the Z5 but just wanted to make that clear if you are a competitive player. The composite version of the Z5 weighs about an ounce heavier than its graphite sibling. The extra weight is a good option for players needed some extra power from the baseline and boosting their overhead smashes and hard passing shots. The composite finish also gives you a bit more texture to bite into the ball a bit more that will help for your control and finesse shots at the NVZ. Besides the weight, as far as the overall shape and size, the two paddles are almost identical so it really comes down to the weight you prefer and how much of a factor the composite hitting surface vs glossy graphite is to your game (i.e. spin serve, putting an effect on your shots). An added bonus is that the composite model often retails for just slightly less than the graphite. Extra weight gives an extra boost of power. Good pop off the face. The price is relatively affordable – normally retails for less than graphite model. At 8.5+ ounces, too heavy for some players, especially those with tennis elbow. The graphite Z5 is the winning pick for anyone looking for a quality graphite paddle that’s built with the traditional wide-body paddle shape. As mentioned, the build is nearly identical as the composite except for the weight (see full specs below), with this graphite model weighing in at about an ounce less. The average weight of just under 8 ounces is a good weight for most players from beginners to cross over players coming from tennis or other racket sports. It’s comparable to many other similar shaped wide body graphite options on the market. One other thing to note is that the marketing photos I’ve seen (on the Onix website as well as Amazon and other online retailers) show the paddle is still shown as being fitted with a Gamma grip, these are known as some of the best pickleball grips available. As recently as summer 2018, we confirmed that the current Z5 paddles are now being shipped out with Onix brand grip tape. While this isn’t a deal breaker necessarily, the gamma grip was always one of the features that landed in the plus columns for the Z5 paddle. I can’t really say much about the Onix grip since I don’t use them. You can always replace the grip (it’s an easy process and relatively inexpensive). If I were to buy a new one of these paddles, I’d play with it for a while first to see how it feels. You could always change it out (if you play regularly you’ll changing out the grip eventually anyway and can easily switch to the Gamma). Is this paddle for you? If you are looking for a quality paddle that can be used from the time you start playing pickleball until you turn pro, the Onix Z5 is one of the top picks. Who should avoid this paddle? If you play singles, this may not be the paddle for you. Don’t get me wrong, you’d don’t need to run out and get a separate paddle for singles and I’ve seen plenty of good players win as singles with the Z5 but if you’re shopping for a new paddle and primary play on your own, you’d probably want more reach in something like an elongated or blade style paddle. If you like the Onix brand, take a look at their Summit paddle as a longer option. If you’re still not sure about the Z5 paddle and want to compare head-head with a similar competitor: take a look at the: GAMMA Neutron – New Premium 2.0 Model. It has a similar shape, build and price range as the Z5 Graphite. Paddle Weight Range: 8.4 – 9.2 oz. Paddle Average Weight: 7.8 oz. Here is a quick video from Steve Wong owner of Onix Sports showing off the Z5 and explaining the main differences between the composite and the graphite models. Cosmetic appeal: Some readers have mentioned that they do not like the aesthetics of the Z5. It is true that the Onix website address and #1-866 number are blazoned right across the base of the paddle. Realistically, it’s unlikely you’d need to call them for toll-free assistance over the phone while you are on the pickleball court (let’s hope not). I agree with others that the paddle graphics could be redesigned to be a little more appealing but I’d have to say it’s pretty low on my list of priorities when reviewing paddles whether or not they have the company details printed on the face or not. If you really don’t like the cosmetic look of the paddle you may want to look elsewhere. I do have to say Onix has gotten better with their graphics. The Z5 continues to be the best selling paddle in the Onix lineup. There’s a reason they (both the composite and graphite models) can be seen at courts all over. The classic shape, quality build and solid feel in your hand make it a workhorse of a paddle that’s a good match for all-around players from novice to advanced levels. The two models also give consumers flexibility since you have the graphite option for lighter, touch players and the heavier composite version for ex-tennis players and hard-hitting bangers. Price-wise, the Z5 comes in somewhere in the middle of the spectrum, with new paddles launching regularly in the $150 range, the Z5 is still well below that. The Z5 is regularly mentioned in online pickleball forums and facebook groups and in general gets very positive reviews. While not a cheap paddle by any means, if you are serious about playing pickleball, the current retail price seems reasonable for a quality paddle that is built to last for years. Onix is also a well-known pickleball brand that stands behinds it’s products.